If you've been using Google services for a few years, you've probably already heard of Google Wallet. It was a virtual wallet that could be used to store payment cards or loyalty cards. In January 2018, Google announced the merger of Google Wallet with Android Pay to create Google Pay. Google Wallet then disappears from the radars... until today. 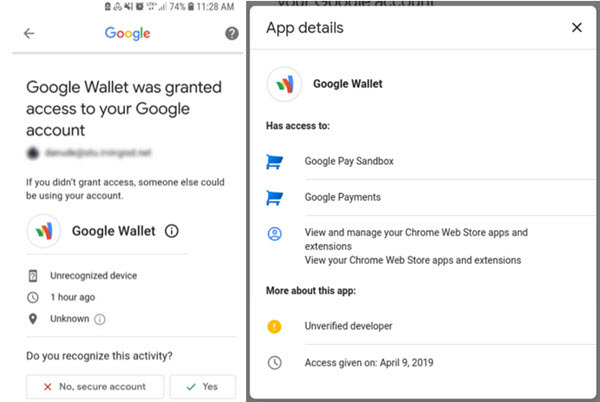 Indeed, a handful of users report receiving notifications that a service called Google Wallet has been granted access to their Google account. These messages indicate that the application would come from an "unidentified developer" and the device used for the connection is unknown. Equally worrying: notifications indicate that the application would have access to Google Payments, which could indicate that it is a scam to access users' payment data. According to AndroidPolice, Google is investigating the problem but the company has not shared any additional information. If you receive any of these notifications, it is strongly recommended to check your Google Account activity information (via this link), change your password and be aware of any money movements on bank accounts.